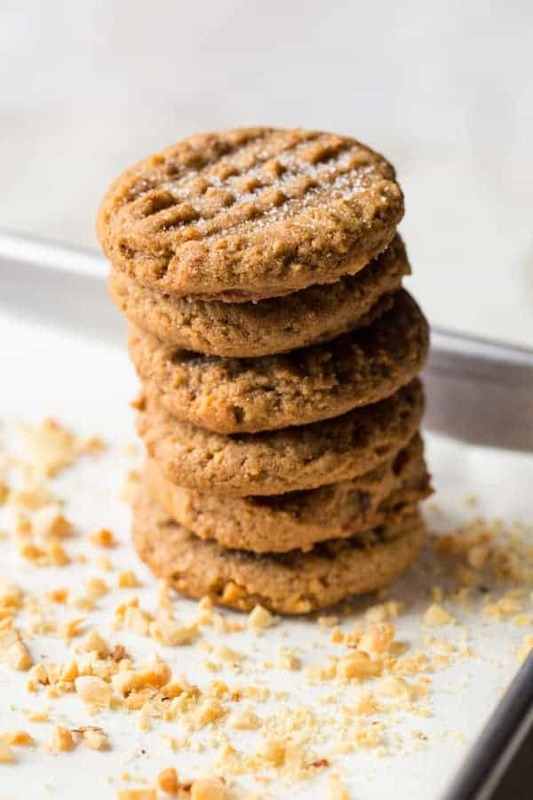 3 Ingredient Peanut Butter Cookies use only peanut butter, brown sugar, and an egg. That’s it. Chocolate chips are a great addition but are totally optional. *This one is probably just an oversight. Send the blogger a nice note. They will die when they read it and then correct the recipe asap. That’s how I felt when I first saw a recipe for flourless peanut butter cookies. If you’re not familiar with it, the recipe goes like this: combine peanut butter, an egg, and some sugar. That’s it. 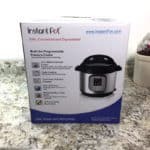 The first time I made it, I was pretty sure the recipe wouldn’t work. In fact, I think I made the recipe with that attitude. “Let’s see what all this ruckus is about!” I mean, c’mon, peanut butter, an egg, and some sugar? My baker’s sense told me that the peanut butter brings fat, the egg gives us structure. but the sugar stumped me. In baking, sugar is a liquefier. That means that when it gets hot, it turns to liquid. Too much sugar in a recipe and cookies can spread all over the place. Without a little flour to hold the sugar in check, I really thought I’d have puddles of peanut butter on my baking sheet. I grabbed my bowl, stirred everything together, and, well, the first surprise hit. The dough looked like…dough. It was maybe a little softer than regular cookie dough but it scooped out well and held the traditional fork imprints nicely. As the first pan baked, I switched on the oven light–fully expecting to see puddles. That never happened. The egg did it’s thing, lifting the dough ever so slightly, and holding everything together. After the cookies cooled, they looked perfect. I took a bite. Oh my! They tasted like the most peanut buttery-peanut butter cookies I’d ever eaten. They were soft with just enough crunch on the edge to make you feel like you were eating a cookie and not a power bar. As much as I liked the cookies, I wanted to love them. The recipe I followed used a full cup of granulated sugar. 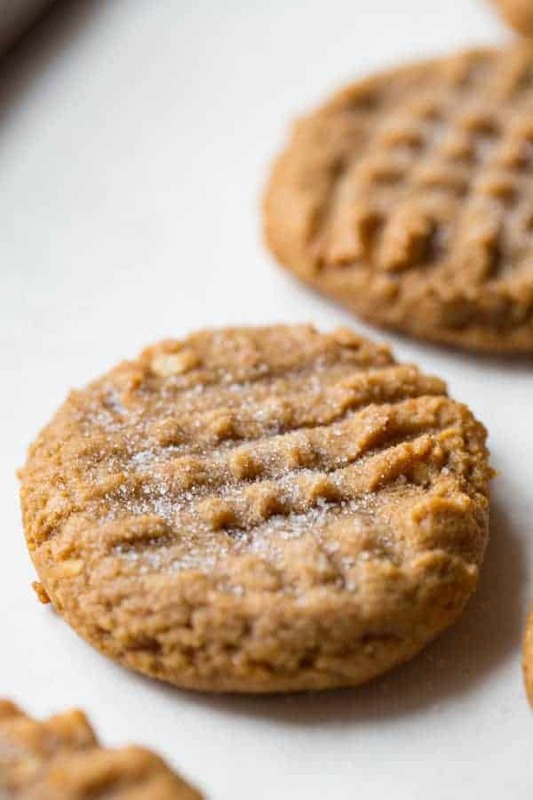 This made for really sweet peanut butter cookies. Since granulated sugar only brings sweetness and not flavor, I decided to swap it for dark brown sugar. I figured a little molasses flavor would pair nicely with the peanut butter. Then, since I like crunch, I used natural crunchy peanut butter instead of creamy. Because to me crunchy > creamy. Obviously this one is just a preference. But I do encourage you to use natural peanut butter. 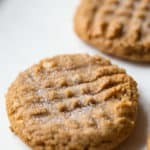 The fat in traditional peanut butter, usually a shortening-type fat, gives the cookies an oddly greasy and almost plastic texture. For fun, I stirred chocolate chips into half the batch. I don’t think I need to explain to you that peanut butter and chocolate are awesome together. I mean, you’re reading a food blog. You know this. If you love peanut butter, add this recipe to your must-try list. It’s that good. And don’t I wish that finding out you were wrong always tasted this good. 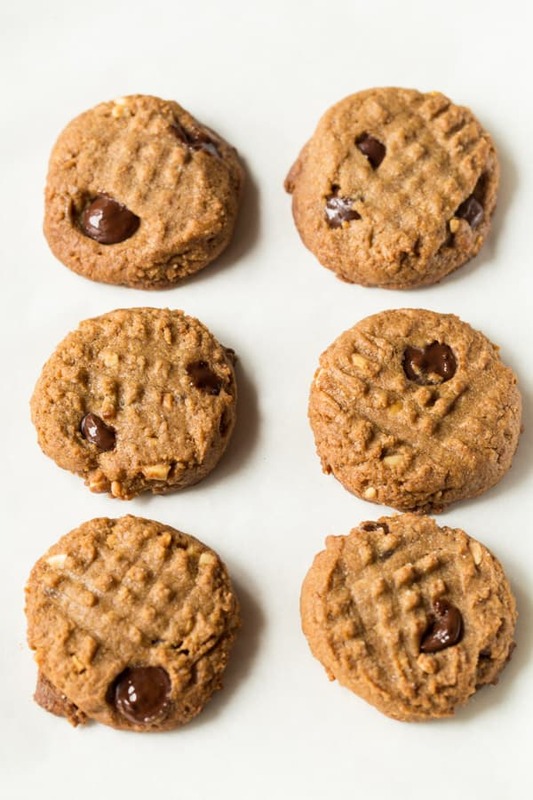 3 Ingredients Peanut Butter Cookies are so easy-to-make! Use crunchy natural peanut butter and brown sugar for the best results. Adjust oven racks to upper middle and lower middle positions. Preheat oven to 350 degrees F. Line two rimmed baking sheet with parchment paper. Stir together peanut butter, sugar, and egg in a medium mixing bowl. Stir in chocolate chips if using. Allow dough to stand for 10 minutes. This step is important. Don't skip it. Drop dough, about one tablespoon each, onto prepared baking sheets. Lightly press tops of cookies with tines of a fork, making a crosshatch pattern. Sprinkle lightly with granulated sugar, optional. Bake cookies, until golden brown, about 12 minutes. Allow cookies to cool on the pan for five minutes. Then transfer to a wire rack to cool fully. Store, wrapped, on the counter, for up to four days. 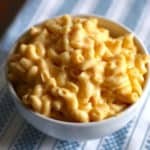 Thank you for all the explanation that came with this recipe. I wanted to try brown sugar instead of granulated to get more flavor. You did it for me and helped me understand the why’s and the how’s. I will also follow your suggestion for natural, crunchy peanut butter. I look forward to my next batch of peanut butter cookies! 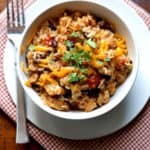 I’ve been using this the recipe for a long time. I use store brand peanut butter and half a cup of organic sugar and half a cup of turbanado sugar. THere was a fourth ingredient 1 tsp vanilla i have left that out as it didn’t make a difference in the flavor. I was skeptical but these delivered . Best peanut butter cookies I have ever made and eaten! 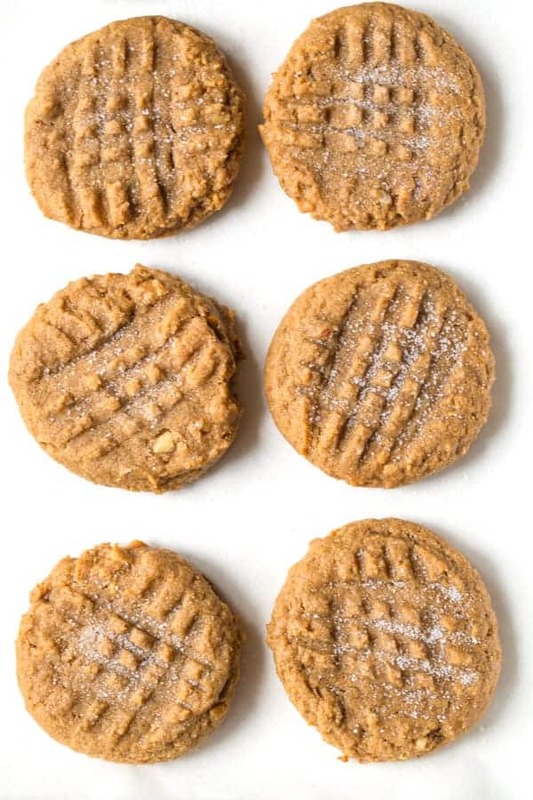 I made these with regular Kroger brand smooth peanut butter, after reading that natural PB made them too oily. I used brown sugar, a little less than a full cup, and added a teaspoon of vanilla extract, which was in another variation of this recipe. The dough was a bit loose so I popped it into the freezer while the oven preheated. This helped immensely. They came out great. I will add chocolate chips and/or peanut butter chips next time, just to add something extra. All in all, a great, easy recipe for an inexpensive dessert, especially for peanut butter lovers. They were really good. I’m not sure of the calories. Sorry! I used two eggs to make them gooey… and just Jif Peanut butter. And then scooped out 24 cookies. The calculations I came up with are only 18 calories per cookie?? Can I use light brown sugar if I dont have dark?